It was the night of nights. There was an appearance like none the world had ever seen. There was an announcement like none the world had ever heard. There was adulation like none the world had ever experienced. And the world was forever changed. The shepherds were watching their flocks that night. That’s all. Just a normal night for a shepherd. Maybe they were glad to have sheep to watch. Maybe they were wishing they had something else to do for a living that wasn’t so cold and didn’t smell like sheep. It was quiet. And dark. Then everything changed in an instant as the sky lit up when an angel of the Lord appeared. The angel was not there. Then he was. It wasn’t like the shepherds looked way off in the distance and saw a dim light moving in their direction. Like one turned to the other and said, “Hey, Levi. What’s that coming yonder?” Levi answered, “Don’t know, Jake. But it’s headin’ this way, and I’m getting’ just a mite skeered.” No. They didn’t see the angel approaching. There was no warning whatsoever. The angel was on them in an instant. And, “The glory of the Lord shone around them.” The shepherds were not slightly amused. Or curious. Or mildly irritated. They were terrified. The pictures that men have painted of this scene over the years are almost comical. They often portray the shepherds as rough-hewn burly men, and the angels as delicate women with curls and rosy cheeks and wings. The paintings often make you wonder, who was afraid of whom? The paintings make you think the shepherds should be saying to the angel, “Don’t be afraid little lady. Us big ol’ shepherds won’t hurt you. Come on down here and don’t be shy. You can talk to strangers. It’s OK.” Again I say, no! 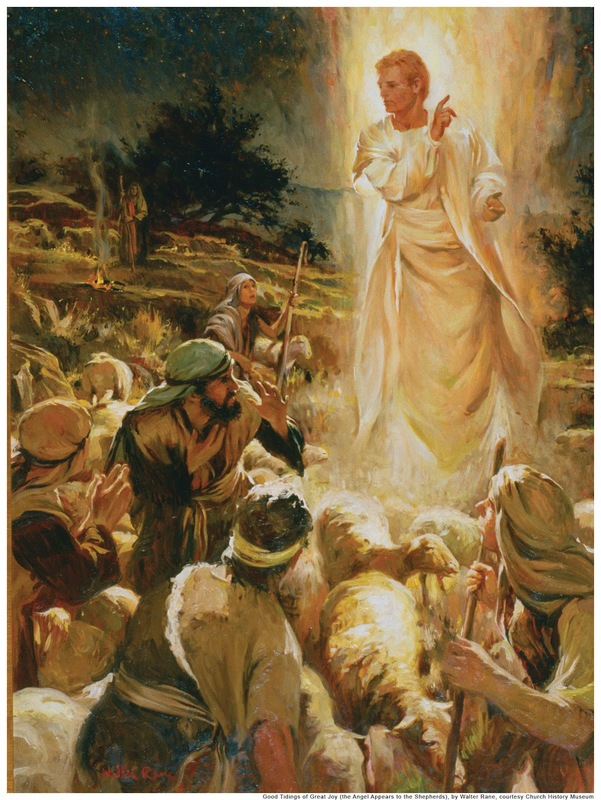 The angel was awesome and the shepherds were terrified. “Filled with great fear,” Luke said. It was the night of nights and the appearance of an angel changed everything. Because he came with news. And with that, the one angel was joined by a battalion of angels, and they all began to praise God. It was adulation like none the world had ever experienced, as these angels joined the chorus, exalting God for this night of nights, when the plan of salvation was revealed to a few lowly shepherds on a Judean hillside. Here we are today. Still celebrating that first Christmas, when Jesus came as Savior, Christ, and Lord, and we were given all we would ever need.